Picture Celia Roberts 2nd place submission courtesy of wafaireland.com. On June 18th, 2014, the 11th World Flower Show of the World Association of Floral Artists took place in Ireland. What a spectacular event—31 countries were represented by 670 competitors in 31 classes. The class size ranged from 15 to 34 competitors with the average being 20 entrants per class. Eleven Garden Club of Toronto members had the courage to accept the challenge to compete on the world stage. Canada had 26 entrants in total with 5 placements. Each member country is invited to present a “national” exhibit which is not judged, but forms the entry to the show. 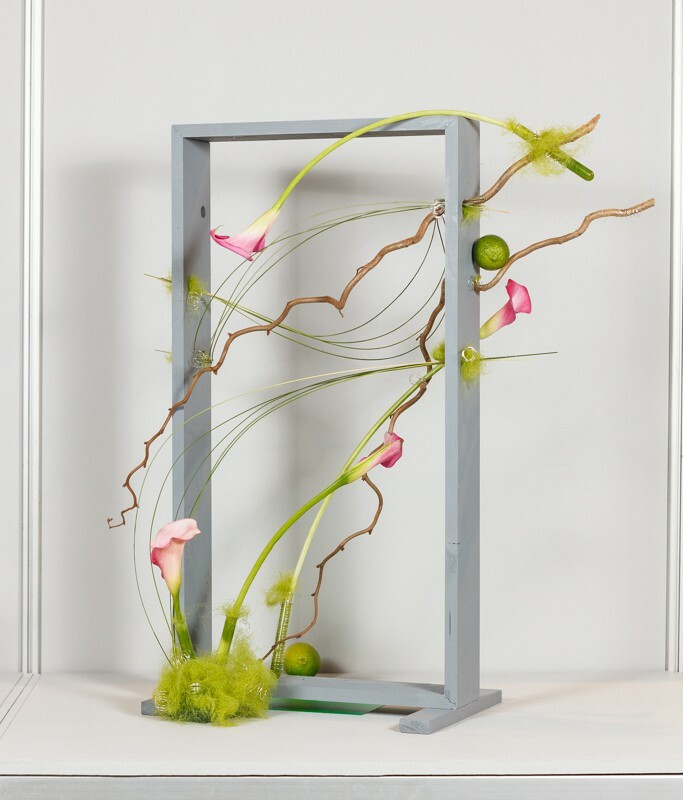 Our representative designer was Trudy Grantham, who repeated her award-winning design from the GCO Flower Show of 2013, depicting Canada in pine sticks with red anthuriums from sea to sea to sea. The 670 competitors exhibited in two large halls of the Royal Dublin Society in 31 classes, ranging from small designs to abstract ones to children’s designs. Garden Club members Celia Roberts placed 2nd in class “Conundrum, Line,” (see photograph) and Rosemary Passafiume-McLean took honourable mention in the imposed class “Spontaneous Approach.” Congratulations to all- this is like winning an Olympic medal! Canada Blooms is such a highly respected flower show on the “International Flower Show Circuit.” Many people spoken to had competed at or attended Canada Blooms, and many more want to come. As competitors, they raved about our hospitality, and for sure a big part of that credit goes to the Garden Club’s Floral Design Committee, which organizes all the events for the “Internationals” every year.